I can remember some of my first few terrible yoga classes. I was going into a Forward Fold and my hands barely touched past my knees. I was frustrated, disappointed and could not understand how I can be “good” at something if I could not achieve perfection. I was so caught up in my mind that I was not even listening to my body. Finally, years later, I revisited my yoga practice, and with the help of some amazing teachers, I found my breath. This was a huge impact on my life. Breathing and holding poses for extended periods of times taught me how much time we should take to stop and pause before acting on any situation. I remember the day I was in a room and everyone clapped. I did not understand what was going on, except my heart felt good. I took a leap of faith even attempting the pose. Suddenly all these strangers had my back; “you can do it!” “you’re almost there” and whatnot. Suddenly these words of encouragement had me doing headstands. I never thought I could do any of the poses I have under my belt today. The heart chakra teaches us stamina and willpower, which push me every day to go further in my practice and to always keep trying. What they say is true: It’s more about the journey than the perfect pose. I was always a chatterbox. The first few months I did not even close my eyes in Savasana (corpse pose). I could NOT be silent. Suddenly when I let my body tell my mind what to do, poses started coming naturally. I listened to my body. A wise teacher once told me “your body is your library.” It’s true, if you don’t know if your thigh should be inner or outer spiralled, do both and see how it feels. It sounds simple but it takes a lot of silence. I came into yoga with almost nothing. I had just returned from a cross-country journey and was living out of a hamper plastic container and an air mattress. I still had so much baggage though, living in memories that had happened years before. I let them define who I was. After hundreds of back bends and vulnerable poses, I let thoughts and feelings flow freely out of me. Now I can let so many more present moments exist. I cannot tell you how future-based I was living. Will I have a house? Money? A good paying job? With yoga, I was so concerned with “achieving” the pose, I could not get there. You can’t live in the past because it’s over, you can’t live in the future because it may never happen, so guess what -- the only variable is now. SO LIVE FOR IT! I started to understand how content I was with whatever stop I had on my poses. 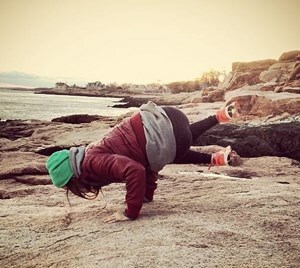 Instead of handstand, maybe I could only do standing spilt…but it was a start. It was something. The beautiful thing about yoga is all you need is you. You barely even need a yoga mat. I find balancing poses to be easier on a wood floor anyways. Half the time I am either on a paddleboard or at the beach doing it. I’ve learned to let go of so much material items I just didn’t need, as well as negative relationships. If it no longer serves you, it’s only a disservice to you. If you are in the beginning or middle of advancing your practice and start to feel like I did -- fed up, sad, or anything else -- just remember to keep practicing. I believe the universe gives back what you put out, so if you put out unconditional love and patience, that is what you will receive in return. Listen to your body and remember it’s not about the perfect pose. by Dani Shirtcliff - Dani has been studying and practicing yoga for more than 10 years with a dedicated practice for the past three. Her teaching incorporates styles such as Vinyasa, Iyengar, and Anusara. Dani is now training with Marc St. Pierre to complete her 200-hour teacher training. For the past couple years she has been studying and practicing photography and yoga in Mallorca Spain, her second love. Find out more about Dani here.